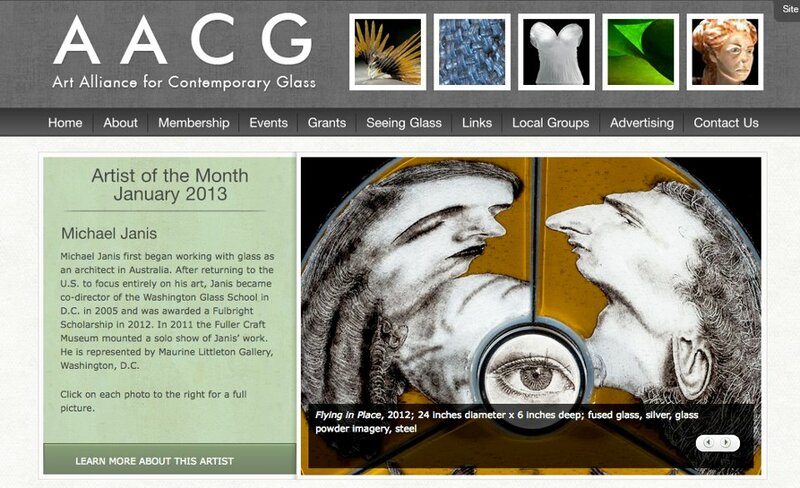 The DMV's own Michael Janis is officially the flavor of the month for the Art Alliance of Contemporary Glass! Check out the AACG's website here. If you collect DMV artists and don't have a Janis, then you either suffer from glassism and are an official glassite, or you are simply a comemierda. GH How is it that you came to irregularly shaped paintings, or why did you abandon traditional rectilinear canvases? SC If I think about how I came to challenge the traditional format of painting, I think there were a number of threads that at some point came together. As a kid, I spent a lot of time in the contemporary collection of the Cleveland Museum of Art, and three pieces in the collection really got to me. One was a Ben Nicholson geometric relief, one was a small wood construction by Jean Arp, and the third was a Claes Oldenburg soft drum set. I also began to look at the other pop artists, particularly early Tom Wesselman pieces, which combined real objects and collage, along with painted images. At the time, I did my own versions, multiple canvasses creating unusual shapes, three-dimensional objects resting on them, things like that. By the time I got to RISD in 1972, it was accepted truth that painting was dead. Most of our conversation was around the question of what painting could be if it wasn't what painting had been - flat, square or rectangular, a picture of something. Since this kind of painting no longer existed, we didn't learn how to paint, we learned how to think about painting, to think about painting as color, as shape, as object. We also thought it was our responsibility to create a new painting (ego). This was certainly in the air - you had Frank Stella, Elizabeth Murray, the whole Pattern and Decoration thing, and here in DC you had Sam Gilliam, who I had the opportunity to study with in graduate school. I started tentatively - building my own frames, decorating the frames, and framing with fake fur - things like that. At some point, I began cutting up my canvasses, collaging them back together, thinking about the canvas as an object, working from the inside out (not unlike Stella’s early Black paintings). This seemed like a new way to think about painting, not relying on the size and shape as a given, a field to work in. GH Following the shaped paintings of 1991 to 1993 you returned to the traditional rectilinear stretched canvas. Why? SC At a certain point, I realized I wasn't going to redefine painting, I just wanted to be a painter, and I wanted to be a good painter (not an artist, not a revolutionary, just a PAINTER). I also realized that there were many kinds of painting that I hadn't addressed, or had ignored, or was ignorant of, and I needed the space to try them, and I needed the format, the tradition, and history of PAINTING (not art, photography, installation, sculpture, ideas - just the history of painting) to work from, to work against, to bounce off of. GH Would you ever return to working in an unusual format? SC I can't really see changing the shape of a painting now. At the time, the decision seemed to be not a choice, but a necessity - there was a need and an urgency to work that way. If I were to make that move now, it feels like it would come from a different place, and a false place - a contrived move, a choice, perhaps for novelty, but novelty is not as compelling as urgency. If I returned to shaped canvasses I wouldn't paint them the same now, but I would certainly reinvestigate the ideas and motivations that generated them, and I am constantly revisiting these ideas and patterns and gestures and places. I think what is different for me now is that I am no longer thinking too much about the bigger art world and how my paintings deal with, react to, accept or reject it, and I am no longer at all interested in or attempting intentionally to make work that is subversive, aggressive, in your face. Those thoughts came out of youthful, teenage somewhat immature (in a good way) attitudes. My paintings may still be aggressive or not easy at times, but probably as a result of still trying to surprise myself. GH Do you consider your work to be pure abstraction or is there a subject? SC I'm not sure what is meant by pure abstraction - these definitions get tricky. I would say these paintings are not non-objective (as we would describe classic Mondrian or most of Frank Stella's paintings: paintings referring to no thing). They are most definitely abstract - abstracted from many things - the gesture the body makes, curves and arcs; repetition (of shape, line and movement, and things I love to do again and again and again, not just in painting but in daily activity); and abstracted from things I see or feel in the natural world (the flow of water, the pattern of waves in the ocean). GH Walter Hopps once suggested that the most significant American contribution to art may be the various refinements of abstract painting and that there may be an end to American abstraction. Might you be the last abstract painter? SC I love this question about being the last abstract painter - I remember reading Philip Guston on this. He said Pollock wanted to be the last painter, and that he (Guston) wanted to be the first - I think by this he meant to go back to the beginning and start again, which is pretty much what he did. Probably in 1991, I thought that perhaps I could be the last abstract painter (ego talking), now I am much more interested in the beginning of abstraction - how did we get to it, and am constantly curious about those artists that had to figure it out - Matisse, Kandinsky, Mondrian, Stuart Davis. Clement Greenberg would also probably believe that there could be a last abstract painter (he was in for a surprise). And since I hope and think that my painting keeps developing, I hope there is no LAST anything. GH It has been over 20 years since you created the work being exhibited in the Hemphill show in 2013. Twenty years later do you think viewers will see the work differently? SC It’s an interesting question. Is it possible to not think of them as from the past, because we know they are of the past (1991 - 1993)? Does this change our response? Maybe if I can answer the questions for myself - how do I see them? Are they alive for me? Would I do the same paintings now? They are very much alive for me and I react to them the way I react to most of my successful paintings - did I do that? I know that a painting is finished when I no longer see it, it no longer bothers me or calls out " hey, this part isn't right, this area is unresolved." Until the painting is finished, it is constantly tapping you on the shoulder or biting at your ankles, asking to be paid attention to. So, when a painting is finished, it kind of disappears, and when you see it again, it seems surprisingly alive. GH How has the art world changed in those twenty years? SC We all know how the market has changed, and this is not of much interest to me obviously. But artists have also changed. The whole idea of a painting being the result of an activity seems to have vanished, and I don't mean the idea of activity like Sol LeWitt. Maybe it is this idea that defines my generation of painters, or my neighborhood. GH For you it’s the activity of painting not the painting itself? SC I am thinking about how this has played out in literature. David Foster Wallace talks about Pynchon and the plotless novel, multiple possible non-endings, non-narrative structure, the reader completing the narrative, a non entertainment (Foster’s term). What followed is novels like The Marriage Plot by Jeffrey Eugenides, a novel about not being able to write a novel based on a marriage plot, or On Beauty by Zadie Smith, about the non resolution and opposing schools of thought about beauty and aesthetics put into an entertainment. I think this is perhaps the kind of painting I am after - one that recognizes that it is about painting but still a painting that has to fulfill all of the functions of painting - entertain the eye, spark the imagination of the viewer, and get into the ring with the entire history of painting. GH Outside of the art world what has been the strongest influence on your work? SC I have always said that I am much more influenced by my friends than by the larger art world. It happens that most of my friends are painters, but they are friends first. I have learned from all of them to go to work every day, because you never know what may be a good day in the studio, and you better be there just in case. I have learned to look at, pay attention to, and experience as much as possible. And I have learned to have an open attitude, to not predict or assume, and to take what comes along. Of course, these are great painting lessons, but they work pretty well for everything else too.